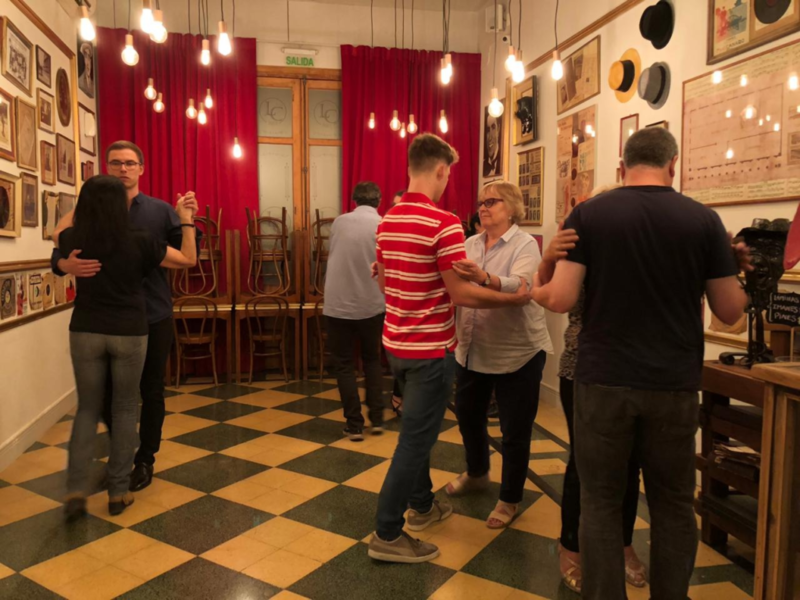 A group of students from La Herradura attended a tango class, set up by the school, which took place inside the magnificent Palacio Salvo building in the Ciudad Vieja part of Montevideo. Palacio salvo is a grande building that was originally meant to be a hotel but ended up being used for offices and private residences. It was inaugurated in 1928 and until 1935 was the highest building in south America. The site is renown for the tango La Cuparsita, written by Gerardo Rodriguez in 1917. Nowadays there exists the tango museum on the ground floor of the building which displays the history of Uruguayan tango and La Cumparasita. Although we came there to Tango one of the first things we were told about was that there was a ‘supposed’ phantom that inhabits the Palacio Salvo building. This rumour has somehow managed to maintain itself to this present day. Indeed our professor Juan told us he did not believe in this rumour until there was an American student studying at La Herradura who was staying in the residences of Palacio Salvo. After a few days she came to Juan and claimed something haunted inhabited the building and that she could not stay there any longer. After this strange event our professor Juan became a believer in the supernatural. The Tango lesson itself was led by a flamboyant middle aged lady. None of us had ever had a tango lesson and in the hour time period which the lesson lasted we attempted to master the basic steps of the tango. Learning the tango however is a bit like learning another language. You need a lot of time and persistence as well as practice to really be able to master it. Although we all enjoyed our lesson and became relatively proficient in the pure basics of the tango, we knew that there would be a long way to go to be able to dance at an acceptable level. Below you can see some photos from our authentic uruguayan tango experience.